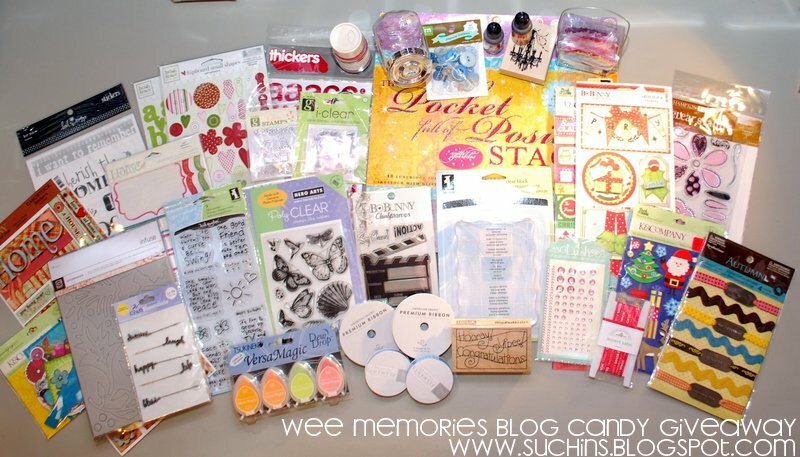 ..Wee Memories..: BIG HUGE Blog Candy giveaway TIME! BIG HUGE Blog Candy giveaway TIME! We made it to 700! Im so excited that everyone is enjoying my blog and challenges. My Design Team and I work hard to bring you fun and fab challenges each Saturday. I hope you enjoy them! Thanks for supporting us!! And theres allot of GREAT things to come in 2011!! A HUGE giveaway to thank you for your support!! 1 - Be a follower (if your not already), if you dont have a blog you can always follow by email through the Feed Burner link <--- over there. 2 - Post this Blog Candy in a post on your blog AND on your sidebar with the photo and a link back to my blog. All you have to do is right click on the photo to save it. 3 - Once you've posted about this on your blog, add your link to the Inlinkz below. YOU MUST put your name on the list to be in the giveaway drawing. Do #1 and 3, and post about this giveaway on your Facebook, Twitter or Flickr... anywhere you think you can post about it. And for your URL just add your email. Enter here, Giveaway ends on November 30 at 11:59pm PST. Thank you all so much, I appreciate YOU!!!! See below for my pairing up with Joy post. No sé si puedo participar, porque vivo en España (Spain), pero, por si acaso, me apunto. Ya soy seguidora y dejo el post y el candy en mi blog. Muchas gracias de nuevo y suerte!!! Congratulations on reaching 700 Jenny. Thanks for giving a chance to win this lovely candy. Btw. Did you receive my card??? You have outdone yourself this time with this HUGE giveaway, Jenny!! I've been a follower for a while now and always enjoy grabbing a cup of coffee and checking out your latest posts. I've blogged and posted on my side bar about this fabulous event, and am keeping my fingers crossed that I'm a lucky winner!! Have a wonderful turkey day next week! Congrats on 700! Thanks for the great challenges and for the chance to win the awesome giveaway! Wonderful candy! Thanks for the chance to win. Congrats on 700+ followers--WOW. I'm a follower, and I've posted and linked you to my sidebar. Who knows, maybe I'll win, lol. 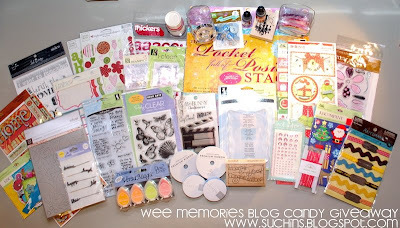 HI Jenny, what a generous blogcandy, thans ever so much!! I posted it and it's in my sidebar. Thank you for a chance to win some awesome blog candy. Congrats and thank you so much for the amazing chance. Have a great weekend. What an awesome giveaway!! Thanks for the chance to win! Wow Jenny, what amazing candy. Thanks for the chance to win. Am a follower, posted on my blog and sidebar. Have a great weekend. indeed Huge candy! Thanks so much. And congratulations on your followers count. and I gotta say (off topic) that I love your blog background! I'm so happy for you for the success of your site....your giveaway is awesome and so are you! Thanks for yet another opportunity to win. I'm already a follower & have posted the candy on my blog. I could not add my name to inlinkz it has disappeared. You are so generous Jenny. Thanks for the chance to win some of these goodies.... but I will still come even if you weren't offering this.... Love visiting your blog. Congratulations on your 700 followers...have followed all the rules and would just like to say....Thank you for the chance to enter this fantastic giveaway. I'm a new follower of your blog, and love what I've seen so far. Thanks for the super giveaway! WOW! Thanks for the great giveaway. Loved visiting your blog! Congrats on the 700, this is HUGE!! :) I've made a post about this on my blog and also added it to my sidebar. I've been a follower. What fab candy, you rock! Congratulations on making it to the 700 mark -- a real feat with so much competition in cyber space! Hi Jenny - Congratulations on reaching 700 followers. Super candy on offer - I have pop you on my sidebar and posted about the candy and I'm now a follower. Good luck to everyone. Congrats! This is huge and I am excited to be part of it and be a follower of your blog! I think I've complied with all the rules - Thanks for a chance at these YUMMY candies!! Jenny congrats on reaching 700 followers. Thanks also for the chance to win such a wonderful prize. Ihave done all the posting and I am a follower. wow! this candy looks very delicious! Wow, this is amazing!! There are a lot of goodies in your blog candy. I really love all your challenges and your blog because I find a lot of inspiration here. Thanks Jenny for all you do!! Jenny, what a generous blog candy giveaway you have! Thanks for all you do to bring all of us inspiration week after week. Your challenges are fun and get us to think outside the box sometimes. I have enjoyed getting to see your designs for WD and enjoy being on the team with you! Congrats on the 700+++ followers! I was already one :) Thank you Jenny for this awesome giveaway! Hi Jenny, I am your 786 follower..It's amazing that you have such great followers..Your candy is delicious & yummy gift and I do and honestly wanted to have it. I just posted your blink into my blog. I am now a follower and hope join in on your challenges! Thanks for the chance to win these awesome goodies! I am definitely a follower and Twittered your Blog Candy. Congrats on 700! My first link didn't work, so I tried again after posting on Creating Keepsakes' site. Am a follower now too! wow! what a HUGE candy!!! looks great! I'm a follower (I'm actually you 799th! one more and you've got 800! congrats! ), I blogged about it (at the bottom of my last entry) and in the sidebar too! Your blog is new to me but I love it. Thanks for the inspiration! Great giveaway.. hope i win.. I've been a follower for a while.. great blog.. Thank you soooo much for the chance to win! I am now a follower and I've done everything required to be entered! Thanks again sooo much!!! So glad I found you through Stephanie's blog. Awesome giveaway. Off to spread the word. What a great giveaway....thanks for the chance to win...don't have a blog but have become a follower! Congrats! I saw now you've reached 850! I just become a follower and thanks for the chance to win such a great giveaway! Yummm. Thanks for the chance to win such an awesome candy!.. My mistake i deleted my entry.It was the last one. wowsers! look at you collecting the best things out there and putting them up as blog candy! Generous!!! thank you for this chance!!!! Your blog candy is very yummy!!!! Jenny, is the Inlinkz having some problem? It seems that the due date is on 30 November 2010 but I cannot enter my name into it as it said collection closed. Anyway, thanks for the chance to win the candy and congratulations on the new recruited followers. I posted a blog and on my sidebar on this giveaway. Thanks! Hi there, I am having troubles with LINKY too.. says collection closed? Am so excited about this candy.. thanks for the chance to win..
Am an avid follower of your site ! I'm a new follower and I have put a post on my blog and on the sidebar! I loved their work and also this birthday gift! I posted on my blog as posts and the sidebar! But I could not sign up here ... but, as it is until November 30, I infer that the registrations are still open! I did post it to my blog and sidebard..
Congratulations on so many followers! Thanks for offering the fabulous blog candy. I am now a follower and have posted this on my blog and on the sideboard. i am a new follower to you. It is 28! Why it is closed? Here's my link to my posting, since the date changed and the inlinkz didn't get the memo :) ! Thanks for being so generous!! Congrats on reaching 700! What a great accomplishment. I'm a new follower. Thanks for the chance to win. Congrats on 700! Wow that is quite an accomplishment.